Abi Castro, 1983, in front of Second Presbyterian Church. Today we will look at the Cubans who came in the 1960s and 1970s. The overthrow of the Batista government in 1959 stirred waves of Cubans to emigrate to the United States. In a study, 'The Cuban Experience in New Jersey,' E. C. Condon divides the Cuban exodus into several stages. In 1959, displaced government officials and families fled to save their lives. In 1960, they were followed by capitalists and landlords from recently nationalized businesses. The following year professionals and technically skilled people left, citing Fidel Castro’s Communist policies on economics and education. From 1962 until 1963 these people were followed by more middle-class representatives, small merchants and other white-collar and blue-collar workers, and by the mid-decade disillusioned workers who stayed were leaving whenever they could and with whatever they could salvage from their unhappy country. The brain drain from a once-prosperous island nation extracted a terrible toll. But Cuba’s loss was America’s gain. The infusion of hard-working, educated, sophisticated newcomers was making a difference on the mainland. The Cuban Minority Planning Study indicated that by the mid-1960s Florida had gained 252,529 Cubans, New York 98,479, New Jersey 71,233, and Illinois 19,647 as a result of the Castro regime. According to the Condon study, some Americans considered Cubans a liability because of the expense of accommodating them in New Jersey. Quite the contrary, 'Cuban immigrants created, nearly single-handedly, a highly successful program of urban renewal in the deteriorating neighborhoods of many communities, where they took over row after row of small stores closed by their former owners and turned them into flourishing enterprises.' Soon Union City was second only to Miami as a capital of Cuban America, beginning to prosper where only decline was noted a few years before. But the success of the transported mainland North American Cuban depended a great deal upon individual sacrifice. However, the adjustment to a new country, the mastering of a new language, and in many cases, the adaptation to an entirely new lifestyle were done amazingly quickly. The turnaround from menial worker to manager/entrepreneur has never been matched by any other immigrant group in the country’s history. Cuban doctors, accountants, lawyers, teachers, business persons and librarians came here, often working first as hotel or hospital workers, waiters and janitors. Within a generation, many Cubans returned to the professional ranks after mastering English and the customs of their new culture. Accounts of this rapid transformation from worker to boss generally include references to a firm respect for education, dedication to the old-fashioned work ethic, a sense of dignity and self-respect, and high regard for family ties. Throw in a little machismo and the changeover from menial to master is made a bit clearer. Another trial for the immigrant was his or her 'settlement' before even beginning to live here. Simply put, you just didn’t get on a boat or plane and set up housekeeping somewhere in Union City, Elizabeth or Newark the next day. You were processed through a government reception center and were required to have a sponsor, which could be a friend, your family or an organization such as a church or club. The sponsor’s responsibility was to make certain that you had a place to live and some sort of employment. There were several centers scattered around the country. The regional one closest to Newark was at Fort Indiantown Gap Army Reservation in Pennsylvania, where at the peak 4,000 Cubans arrived daily. Other locations were at Fort Eglin Air Force Base in Florida, Fort McCoy Army Base in Wisconsin, and Fort Chafee in Arkansas. In New Jersey, the Newark Presbytery relocated many families to the northern part of the state, including Newark. The state’s first Cuban-American resettler was Hagilie Pons of Union City. The Newark News reported the family reunion as 'a dramatic affair with kissing, hugging and crying, but as the media crowded around, pandemonium broke loose. Mrs. Pons screamed and fell face down on a table, almost knocking it over. She screamed again and her son Carlos enveloped her in his arms.' The press of the crowd and the excitement of the event was just too much. As a result future ceremonies were altered. Newark’s involvement with a Cuban community began as Castro’s revolution was still taking shape. In 1960, Cuban Presbyterians and Catholics were being resettled in Newark. The Presbyterian Synod of New Jersey brought families to Newark in May 1962 on the 'Flights for Freedom' from Miami as part of 1,000 planeloads of Cuban refugees being resettled throughout the United States at the federal government’s expense. In the summer of 1962, two planes full of Cuban refugees were dispersed to Jersey City, 16 families to Newark, seven to Orange, four to Elizabeth, two each to Newton and New Brunswick, and six each to Morris and Monmouth countries. Long before, Newark’s Second Presbyterian Church had become a Spanish congregation of more than 200 families from all over Latin America, sponsoring pilot programs in job counseling, housing, schooling, English language training and social orientation. 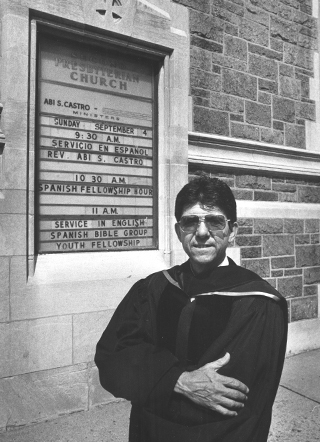 The integration of the Spanish- and English-speaking congregations was another church objective. By the time of the nation’s Bicentennial in 1976, the Newark area Cuban-American population was about 16,000. Often described as a professional and entrepreneurial class, poverty was seldom mentioned in discussions about the Cuban community. Instead, there was an intense interest in establishing middle-class organizations such as the Hispanic Chamber of Commerce and a local Lions Club. La Tribuna, a local Cuban-American-owned newspaper, was one of the area’s largest Spanish-language publications. Carlos Bido, its editor and publisher, arrived in the United States in 1960. By 1980 the responsibility for continued resettlement of refugees had become so important that Gov. Brendan Byrne signed an executive order establishing a Cabinet-level committee to deal with the influx of Cuban-Americans. As a result, a Committee for Cuban Refugee Affairs came into existence to work with the estimated 100,000 members of the Cuban community, based primarily in Union, Hudson and Essex counties. Marco Rizo was a Cuban-born musician whose contributions inspired young Hispanic musical students for almost two decades. Willie Sanchez described him as a 'great man who led by example and who was always willing to help a Newark kid.' Sanchez said Rizo was available when needed, wanted to build a youth orchestra and assisted with scholarships for the Cuban-American community. Rizo’s family came from the island’s middle class. His father, Sebastian, was a concert flutist as well as Marco’s first music teacher. Marco, a child prodigy, studied piano at Juilliard, earned a master’s degree in composition from UCLA, and studied under Igor Stravinsky. But he is perhaps best known for his lifelong collaboration with Desi Arnaz, conducting the orchestra and composing the popular music theme song for the 'I Love Lucy Show.' Rizo also wrote scores for of Hollywood movies while still embracing his love of classical music. His local interest in music centered around an organization known as SAMPI, the South American Music Project Inc., a nonprofit agency dedicated to Afro-Latino musical heritage in the Western Hemisphere. SAMPI performed in schools and community organizations in the metropolitan region, and has been described as a 'basic rhythm, poly-rhythmic interchange that emerges from ensemble performances.' Rizo’s life was cut short. But had he lived longer, the former child prodigy might have made an even deeper and lasting influence on young Newark Cuban-Americans.